bebop spoken here: Early Bird Band @ Jazz Café - Saturday morning, November 5. 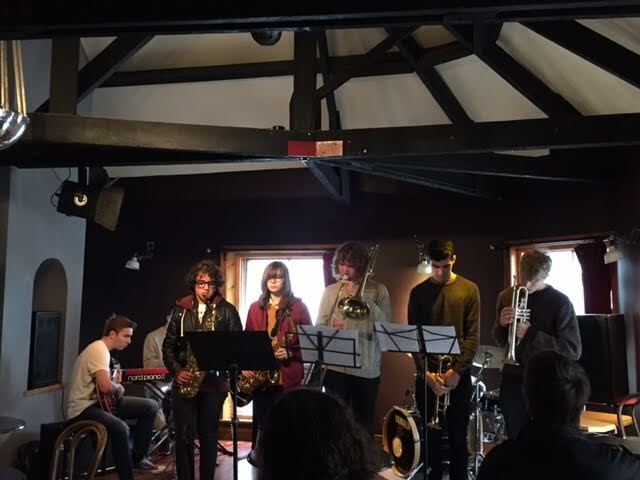 Early Bird Band @ Jazz Café - Saturday morning, November 5. Number One wife was nervous watching them without Francis and the new guitarist seemed nervous when he realised we were his parents (sat with his mother). No need, Lord Paul knows his business and, with no shortage of willing pianists in the band, there was no compulsion to put in another guitarist if there wasn't anyone good enough, but there was, and a very different type of guitarist to Francis. The set began with Yardbird Suite. Ben and James inseparable on trumpets before Ben took the solo. A newcomer, Alex Thompson, took the first of a number of great alto solos followed by Lord Paul. On clarinet for the set, the MD exchanged fours with the ever impeccable Matthew Mackellar. Bye Bye Blackbird followed, the two trumpets really are playing well together now. James took the solo followed by Alex, with Dr Phil displaying a gentle touch - variety and inventiveness making total sense. With just over twenty in the Caff, mostly, but not exclusively, friends and family, Lord Paul took the opportunity to remind us they'd had a mere ninety minutes rehearsal. It never ceases to amaze me that such young musicians (16-18 yrs) can do this. Mercy Mercy Mercy by Cannonball, courtesy Zawinul, and fine solos by Ryan De Silva, and Hedges -the best solo I've heard him (Hedges) play, subtly reflecting back to the melody a couple of times. Mathew Downey up next on guitar, a nice bluesy feel, spending time at the bass end - he also plays upright bass - which makes for a greater impact when he climbs up the scales. Takes his time more than his predecessor, building it up as he went along and creating a thoughtful, satisfying solo while putting his own stamp on it,. Dr Phil showing why he's a great accompanist too. 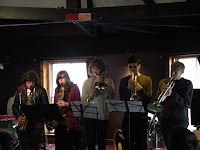 The assembled horns came back in with an almighty sound many big bands would die for! Lord Paul’s flitting about on clarinet adds colour, before it grounds to an ending which Lord Paul admitted they hadn't planned. Paul described Sergio Mihanovich’s Some Time Ago as lovely and it was. Lush guitar chords when saxes were joined by brass before Ben took a solo, nice piano fills behind him. Clarinet solo and it ended with 'lines' from the full horn section, impeccably executed. Blues Walk from the Clifford Brown/Max Roach book, so I'm guessing at a James suggestion, which they played entirely by ear. The restoration of an Early Bird tradition with one bass solo in the final piece, some tasteful comping from the guitarist, leading into another powerhouse performance by the drummer. We're used to never hearing a bum bass note from the Early Birds and this tradition is another which looks set to continue - another pair of size elevens filled. 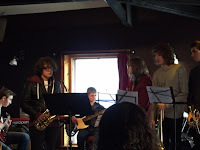 More from Ryan - Paul's found two cracking alto players - followed by a ‘bone solo and my nomination for the most improved musician in the band. Following the final performance by the previous lineup, Editor Lance said the horns were slightly under par, and I agreed, but this morning they were spot on, solid throughout and they brought it to a grand finale. In my estimation they're already ready for a bigger platform and I'm looking forward to seeing them supporting a major local band or travelling musician at a Caff, Globe, College or Church Hall very soon. 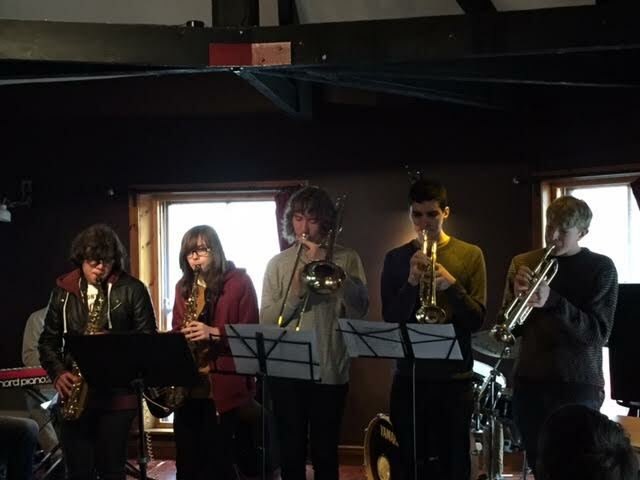 Paul Edis (clarinet, MD), Ben Lawrence, James Metcalfe (trumpets), Ryan De Silva, Alex Thompson (alto), Andrew Hedges (trombone), Mathew Downey (guitar), Phil Grobe (piano), Alex Chipsey (bass), Matthew Mackellar(drums).